We have had private briefings from Westminster City Council, Grosvenor, Crown, Berkeley Square Estate and Pollen Estate and we have also attended a number of planning and licensing committee meetings to represent your views. Please continue to share your views with us via our website which we also hope to develop in order to give our local stakeholders a platform to communicate their views to us. We organised an evening seminar on this topic, held at Thomas Goode, 19 South Audley Street on the 22nd November with speakers from Westminster City Council, New West End Company, and the Heart of London Business Alliance. Councillor Ian Adams, Cabinet Member for Public Protection and Licensing was our keynote speaker. We hope to see considerable improvements in these areas in 2019. We attracted many RSMSJ members to this free event and we plan to organise two more events in 2019. Your thoughts on themes or topics for them would be most welcome. Date for your diary is Thursday 6th June at Mount Street Gardens and you will be able to book tickets online from March this year. The invitations will be sent out in March. We hope to make the Party bigger and even better than last year! We have kept the subscription rates the same for several years, £30 by cheque and £25 by standing order. I also attach our membership leaflet for you to pass on to a friend or neighbour to join us. We need to keep our membership numbers strong. You can pay online or set up a standing order at our website, www.rsmsj.com or by post. 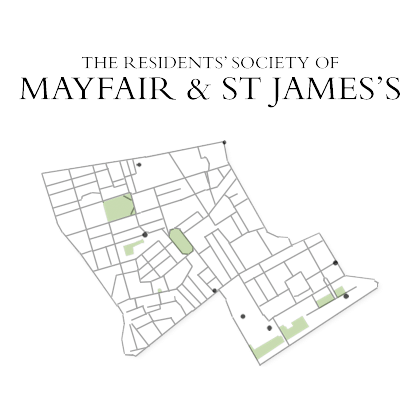 Alex Hauschildt, Marie Claire Lalor, Yasmine Parnes, Jeremy Bishop, and Peter Bullen of the Grosvenor Mayfair Residents’ Association, all long time Mayfair residents, have joined our committee and we are pleased to have some more energetic and committed members to help us with the challenges ahead.